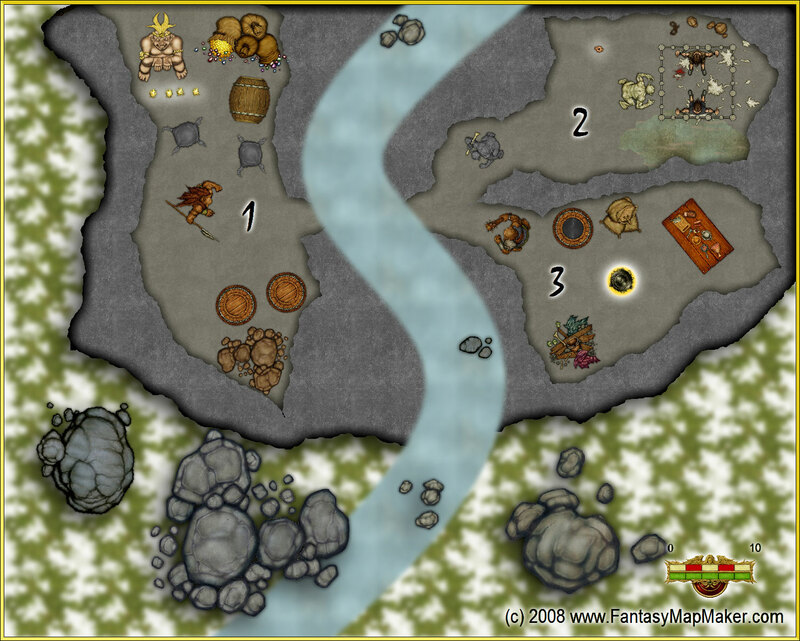 In a rocky tundra, a stream cuts through a stone hill where bugbear bandits hide out from local authorities and await further instruction from their masters. Life as a bandit in the tundra leaves little room for creature comforts: A few barrels of supplies, a couple of cushions used for worshiping the effigy of Gorgoroth and, of course, a pile of plunder waiting to be rescued by wayfaring heroes. This murky cave belongs to the ghoulish underlings who have the task of guarding prisoners. A single candle provides just enough light to make sure the prisoners don’t forget just how bad their situation is. Even bugbears need to eat. A few more supplies, a table for preparing food, a pile of rubbish to cuddle up in and a fire to cook on and keep them warm makes this dank cave a little bit more livable. Nice creation as always and the textures are alot clearer(imo) compared to the previous one.also, nice description you’ve written up there! Thanks for the compliment. This is the first map I’ve done in over a year, I was afraid I’d forgotten how to do it! love this it is short and to the point well done descriptions excellent for a quick short adventure when a number of players cant be there. the remaining 2 or 3 players can do this with a short overland in one evening. Thank you very much for your work.